No Backorders, Full Selection All The Time! *When ordered by 2:00 pm pacific time, Monday-Friday except holidays. Exclusive Best-By-Test Rust Protection for Outdoor, Easy One-Step Installation. In Sizes 1¼" to 6"
Best For Interior Carpentry. Save Time With One-Step Installation Technology. 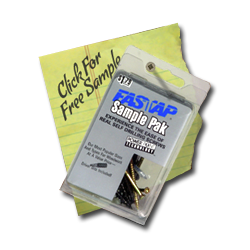 In Sizes 1" to 3"
Quality Bits And Holders For The Best Fastap® Fastener Experience. No Compromise Stainless Featuring Fastap's Power Point Technology. In Sizes 1¼" to 3¾"